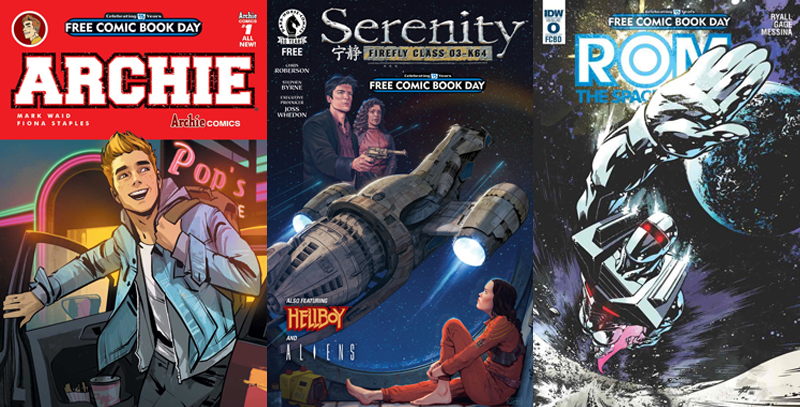 Free Comic Book Day is a most wonderful time for comic fans—I mean, after all, what can be more wonderful than free comics? Diamond has revealed some of the premier books that are coming for the special day next year, so you can start salivating right now instead of waiting for May. 12 books, from a variety of publishers like Marvel, DC, Dark Horse, Valiant, and more, will lead the vanguard of free titles available to anyone walking into a participating comic book store on May 7th, 2016. Some are reprints—like the FCBD edition of Archie #1, the beginning of the series’ much-vaunted reboot by Mark Waid and Fiona Staples—but on the whole, most publishers are dishing out brand-new comics for the event. Valiant is kicking off a new “4001 A.D.” event bringing together its biggest heroes. Marvel is bringing its All-New, All-Different Avengers back to action after their debut in this year’s Free Comic Book Day Special, Titan is writing four new short stories featuring the 9th, 10th, 11th, and 12th Doctors, and Dark Horse is offering a trio of stories based on its Hellboy and Aliens comics, as well as a new story set in the world of Joss Whedon’s Firefly. DC Comics is planning something suitably huge—so huge, in fact, that the company has only announced it as a top secret project! Fancy. Comic superstars Mark Waid and Fiona Staples reimagine an icon in this special FCBD reprint of the best-selling first issue of Archie! Change has come to Riverdale in the can’t-miss kick-off to Archie’s new ongoing series! As the new school year approaches, you’d think Archie Andrews would be looking forward to classes and fun — but nothing is as it seems in the little town of Riverdale. Is this a one-off, or a sign of bigger changes awaiting America’s favorite teens... and the entire town? Find out in this exciting, remarkable and critically acclaimed first issue! Get in line for the foremost Free Comic Book Day four-color giveaway of the year! Pieman and the Cupcake Kid take on a new crime team, Glutenus Maximus and his sidekick Gluten Tag, whose pastry-related misdeeds have led to a ban on all baked goods in Springfield! How will the heroic duo battle their foes without their arsenal of pies and cupcakes, and what’s worse…what will Homer do without his daily dose of donuts? Then, after an unfortunate trip to the dentist, Principal Skinner is mistaken for a vampire. It doesn’t help that Bart fuels the fire (and supplies the pitchforks) to an unruly mob uprising. All that and much, much more — and it’s all free! In the BOOM! Studios 2016 Summer Blast, read all-new, original short stories of David Petersen’s Mouse Guard and Jim Henson’s Labyrinth. Plus, get sneak peeks of the upcoming new Adventure Time: Comics series, the Lumberjanes: Don’t Axe, Don’t Tale special, and this summer’s highly anticipated original graphic novel from Archaia, The Cloud. As a bonus, we’ve included preview pages from Goldie Vance, our newest BOOM! Box debut. There’s something in this Free Comic Book Day issue for everyone! Need a reason to pick up Dark Horse Comics’ 2016 Free Comic Book Day offering? Here’s three: From Mike Mignola and Richard Corben, a lesson from Hellboy’s past is shared. From Brian Wood, a peek into the Aliens: Defiance series with an original tale. And from the world of Joss Whedon, a glimpse at the crew of the Serenity, following the film and the smash-hit series Leaves on the Wind! The Belcher Family proudly celebrates this year’s Free Comic Book Day event with three wild and zany adventures featuring those lovable scamps Tina, Gene, and Louise, plus guest stars Bob, Linda, and all your favorites from Bob’s Burgers! It’s the official Bob’s Burgers comic book based on the fan-favorite (and Emmy Award-winning) Fox animated sitcom, jam-packed with the mouth-watering flavor that longtime fans and curious newcomers can enjoy! He strikes from outer space... hurtling Earthward on his dread mission of cosmic vengeance! Rom the Space Knight is back for the first time in decades, and nothing can stop him! This introductory story re-introduces the character and leads into July’s all-new, ongoing series! Add a touch of spooky to your Free Comic Book Day this year with the first chapter of Ben 10 and Big Hero 6 creator Steven T. Seagle and New Yorker Magazine cartoonist Jason Adam Katzenstein’s Camp Midnight! Not wanting to please her “step monster,” reluctant Skye is dead-set on not fitting in. But when she’s accidentally sent to the wrong summer camp — Camp Midnight, where everyone attending is a full-fledged monster — Skye realizes that not fitting in will be the very least of her challenges! Camp Midnight is the perfect book for readers who love Raina Telgemeier’s Smile but wish it had more bowls of gooey eyeballs in the lunch scenes. Earth’s Mightiest Heroes return in an all-new FCBD 2016 edition! Jump on board the TARDIS with FOUR all-new short tales of the Ninth, Tenth, Eleventh and Twelfth Doctors! Whether you’re a whiz with a Sonic Screwdriver or completely new to Who, this is the perfect Free Comic Book Day adventure for SF fans of all ages! Written and illustrated by the creative teams of the regular comics, this is the ideal place to start reading! The most ambitious Valiant event yet starts right here on Free Comic Book Day with a shocking new vision of the future in 4001 A.D.! The war for the fate of the 41st century begins here with an exclusive, never-before-seen prelude to the blockbuster comics event of the summer by New York Times best-selling writer Matt Kindt and superstar artist Clayton Crain. Rai! Eternal Warrior! X-O Manowar! Bloodshot! Geomancer! Armstrong! And more! The future of the Valiant Universe begins here! Plus: An all-new look inside Valiant’s next hit ongoing series, A&A, from Rafer Roberts and David Lafuente; Divinity II from Matt Kindt and Trevor Hairsine; and brand-new interviews, special features and surprises that no comic fan can afford to miss! To the forest! To the sea! To Legendary Island! Join our Pokémon pals on a quest through Unova for the Legendary joke — while testing your Pokémon knowledge and laughing all the way!